Near all the chivalry of the south had come to Renly's call, it seemed. The golden rose of Highgarden was seen everywhere: sewn on the right breast of armsmen and servants, flapping and fluttering from the green silk banners that adorned lance and pike, painted upon the shields hung outside the pavilions of the sons and brothers and cousins and uncles of House Tyrell. This salad was served at my Game of Thrones Season 7 party. At this dinner, I served 9 courses, each designed to look like the heraldry for one of the Westerosi Great Houses. 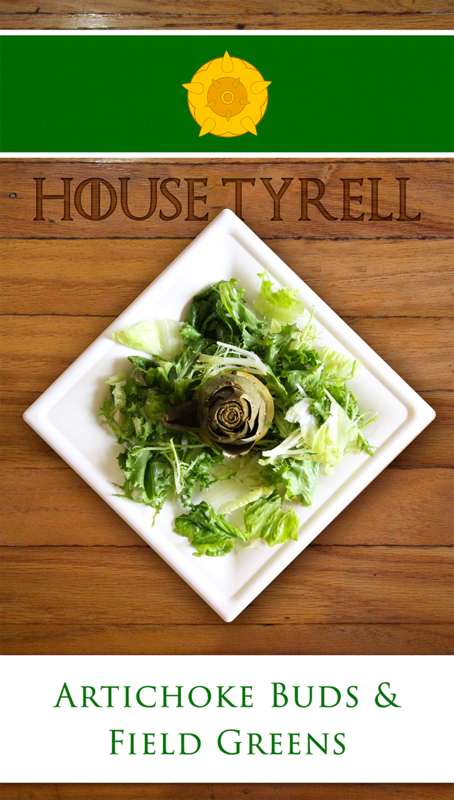 House Tyrell, with their golden rose on a field of green was an obvious choice for the salad course. I thought about a few ways to make a rose shape. I'd previously made apple roses pastries, however there is an unfortunate dearth of Westeros sigils that honor vegetables and I wanted to at least attempt to create a balanced meal. Vegetables cut in the shape of flowers seemed either too cutesy or too finicky. In the end, I went with an edible flower - the artichoke. Although closer to green than to the desired golden hue to begin with, the yellow tones become stronger once roasted. I flavored the artichokes with lemon, olive oil and garlic, and kept the "field of green" field greens simple. Preheat the oven to 375­°F. Tear off a 26-inch length of aluminum foil. Place the foil over a 9x13 inch pan so that the excess length hangs over one end of the pan. Trim the artichokes: slice off the top and the bottom, then use scissors to trim off the barbs from each leaf. Slice two of the lemons into 1-cm pieces and layer them along the length of the aluminum foil that covers the baking pan. Stand the artichoke buds on top of the lemon slices, nestled close together. Nestle the garlic cloves in the spaces between the artichokes. Drizzle the artichokes with the juice from the remaining lemon and then with the 2 tbsp cooking olive oil. Wrap the excess length over the artichokes, then crimp together the sides to create a nicely sealed packet. Bake for 40 minutes, or until a skewer pierces them easily. (Careful when unwrapping the foil - the steam is hot!) Remove from the oven, loosen the foil wrapping and let cool. Wash and dry the lettuce, and tear into bite-sized pieces. Whisk together the extra virgin olive oil, vinegar and mustard. Taste for seasoning, adding salt as necessary. Toss the leaves with the vinaigrette. Arrange 1 cup of leaves on each plate, then top with a lemon slice and an artichoke bud.